Coir is made from coconut husks and is more sustainable than the peat moss (due to the potential destruction of the bogs in harvesting the moss), so coir is preferable if you can find it in your area. Garden centers tend to have these materials readily available. 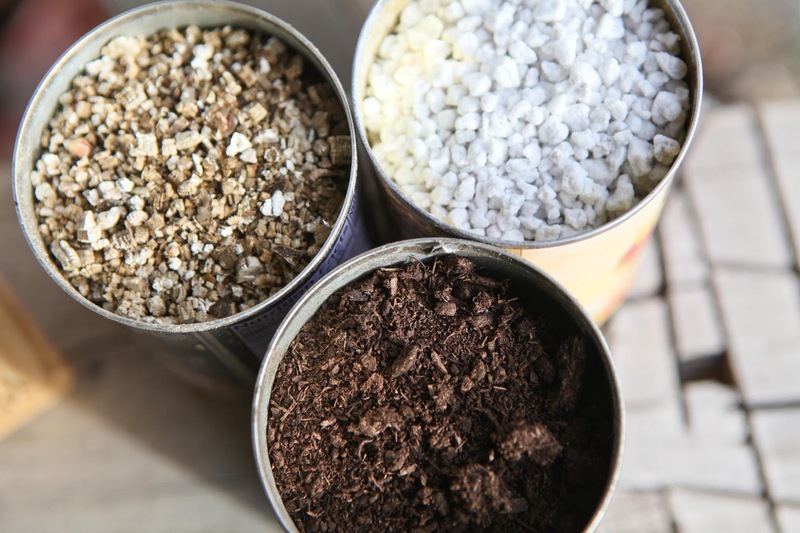 By adding 1 part compost to the formula above, you can make a nice potting soil mix as well. If you plan on keeping your seedlings in their containers for a long period of time before transplanting, adding compost as a fertilizer is a good idea. You can also add compost to the original mix, but I feel its heaviness and water retention properties aren't ideal for beginning seedlings, which need air circulation to promote germination and are prone to mold if too water-logged. Are you beginning to think about starting seeds, too? I shall be bookmarking this recipe! I can't wait to get the garden going again this year! Thank you for this recipe! I did start my tomatoes already but will be sure and try this starter mix next time. In the past, I "baked" compost in my oven to kill bugs, etc. and used it as a starter mix. It worked well but boy did my house smell odd for a day or two! This year I just used a commercially produced organic potting soil but I love the concept of making as much as possible from scratch. Thanks so much! Thanks for the seed starting mix recipe. Yes, I am starting my seed but I have been using commercial mix. Must look into making my own. Yes, ma'am. I am thinking about it - although I have to settle down and wait a bit. I might just try this mixture myself. I have a seed starting mix that I bought last year that will probably do me good this year and then I'll be out. I have been contemplating what to put in my garden and where. Since I started going the local food swap, I have been thinking about different things to plant this year. For example, I ended up with some icicle pickles (which were delicious) at the first swap and so I'm going to plant pickling cucumbers. This is the time of year when I start thinking about digging in dirt and get so excited for it to stop snowing. But since this is Colorado, I must be patient! So I won't start my seeds until April or so. I'm getting excited to start my tomato, pepper and eggplant seeds but I'm making myself wait until at least the end of February. I started them too soon last year and had to transplant them into bigger containers twice! LOL!! I'm beginning to wish I had a place to start them, LOL. Too many piles of kitchen stuff all over the place. Would love to get a head start on my tomatoes and peppers though. Just the other day, I was thinking about seed starting mixes and meant to look one up online. Never did get around to it, but now I don't have to! All of your food recipes have worked beautifully, so I'm sure this "recipe" will be perfect, too! Yes, can't wait to start some seeds, soon, very soon. We don't do a lot, not much space is available, but we do what we can. Thank you for posting this, Jaime--I've never made my own mix, and didn't know how simple it was. Lately I am thinking a lot about starting seeds, though I'm not sure yet what will grow up here in the mountains, and with such a short growing season. I suppose I'd be safe with some cold-weather greens like kale and broccoli. So, until we are able to build our hoop house, this is how we start seeds. And how we share our diverse choices with our community. What a great idea, and an excellent way for your community to share resources! Hello...take a look at my latest post and follow the rules. I have nominated your blog for The Versatile Blogger Award. Oh I sure wish I had better luck gardening here in Texas. Outside of herbs every season has been an epic fail. In Wisconsin it was so much easier. I think peppers may be the only native vegetable to south central tx! Fortunately my CSA has learned how to do it well! What a wealth of information you are! Thanks for this, I will add it to my list of things to try!